So, you have noticed those dark streaks on your roof, or what appears to be green lichen growing out from under your shingles. Don’t panic; this doesn’t mean you’re in for a costly roof replacement, you just need good roof treatments. Roof treatments are a way to clean your shingles, remove the pesky growth, and make your roof last longer. All County Window Cleaning offers these treatments to make your roof like new again. 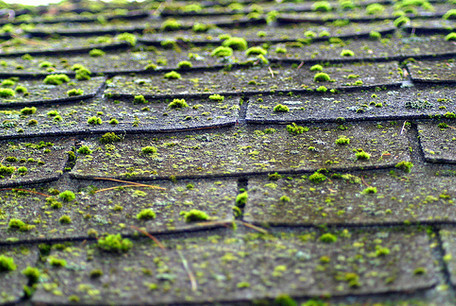 Roof treatments target the life growing on your roof. The chemical treatment and subsequent removal kills the growth completely, which can make your roof look new again. The visible difference before and after the treatment is astounding. Pressure washing should be reserved for the stronger sides of your house and patio areas; it will remove the growth but can also cause permanent damage to your shingles. A softer treatment is recommended and will not cause any damage to the roof. During the winter, roof raking should also be done to remove ice buildup on your roof as well. Whether it is algae, moss, or lichen, these growths will make their home on your roof and only continue to spread if left alone. They trap water on the surface of the shingles, and their strands can permeate the material, causing premature deterioration of your roof. They are natural decomposers; their purpose is to break down the material they grow on and turn it into soil that they can thrive in. A treatment will completely remove this threat, which will, in turn, prevent any issues that you may have with your roof warranty or homeowners policy in the future. These agreements may become invalid if unchecked algae growth is discovered. Roof treatments are relatively inexpensive investments in your roof, making them well worth your time and money. All County Window Cleaning guarantees our treatment with a three-year warranty, this warranty is only good with a full roof treatment. We can take care of your entire home by offering services from window cleaning to gutter cleaning. Call us at (973) 827-8311 to get our team out to your home.